DUPLIN COUNTY, NC – On Friday March 18 at 14:03 hours, the Beulaville Volunteer Fire Department (Duplin Station 6), Sarecta Volunteer Fire Department (Duplin Station 20), and Potters Hill Volunteer Fire Department (Duplin Station 19) were dispatched to 949 NC 241 Highway to the Sandy Plain Free Will Baptist Church for a commercial structure fire. During the response at 14:06, Duplin County EMS Medic 5 advised smoke visible from the Beulaville City Limits. The church complex is about three miles north of the city limits. Beulaville Car 1 also requested Pink Hill Volunteer Fire Department (Lenoir Station 21) be dispatched for fire tankers and manpower at 14:06. Duplin County EMS Medic 5 arrived on scene first at 14:09 and advised heavy smoke and fire visible from all sides of the structure. Beulaville Car 1 arrived one minute later and established Command at a 1 story metal gymnasium and declared a working fire with heavy smoke and fire from Division B near the entry door. Command also advised no life hazards or injuries and that the church day care center approximately 25 foot from fire building had been evacuated. Beulaville Engine 1 arrived at 14:12 and placed two 1 3/4″ attack lines in service and set up a dump tank for water shuttle operations. At 14:13 Command requested Hargetts Crossroads Volunteer Fire Department (Jones Station 22) to be dispatched for tankers and manpower as other fire apparatus from automatic aid departments started to arrive and an interior attack was made by two teams. At 14:18 Command requested law enforcement and North Carolina Department of Transportation close NC 241 Highway from Sarecta Road to Sumner Road for tanker shuttle operations. A water point was placed at NC 241 Highway and Baker Road. 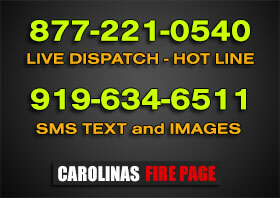 At 14:23 Command requested Northeast Volunteer Fire Department (Duplin Station 9) for there ladder/tower and tanker. The Wallace Volunteer Fire Department also dispatched with Northeast Tower 95 as a special services response. Beulaville Command advised control time at 15:00 and some companies were released. Duplin County EMS Medic 5 remained on scene and provided rehab for the 50+ emergency personal on scene, most units cleared the scene by 16:00 but Beulaville Fire remained on scene with Duplin County Sheriff Department, Duplin County Fire Marshal Office and North Carolina State Bureau of Investigations until about 17:00. Causes and damages have yet to be determined. Article submitted by David Miller.